On Tuesday, January 29, a meeting of the cabinet approved a timetable for the preparation of the medium-term budget framework for the 2019, 2020 and 2021 prepared by the Ministry of Finance and the draft government budget for 2019. It is planned that the government will submit the draft budget to the Saeima on 8 March, as previously reported by LSM. In early February, the government will review an information report on macroeconomic indicators, revenue and general government budget forecasts. The report on the review of expenditure and on the priority activities of the ministries will also be examined, according to the ministry's plan. By 19 February a revised general government budget plan is to be submitted to the European Commission and the Eurogroup for approval. 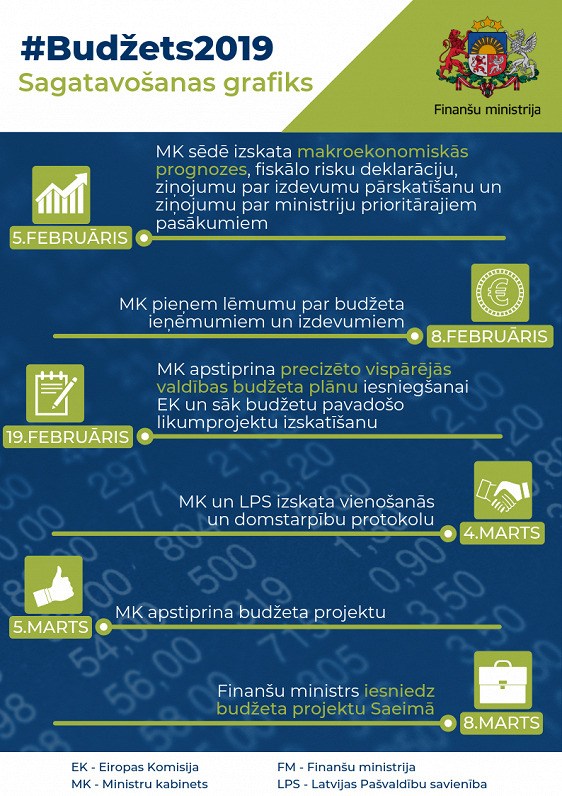 The Cabinet of Ministers could approve this year's draft budget on 5 March, and it is planned to submit the budget to the Saeima on 8 March. Following the cabinet meeting, both Reirs and Prime Minister Krišjānis Kariņš confirmed that the new Latvian government will not make changes to the tax system before the year 2021 at the earliest. Reirs said taxes would remain unchanged this year, and the government would begin to assess the impact of the tax reforms introduced by the previous administration in 2020, and then be in a position to make recommendations for some improvements from 2021 onwards. "We will be talking about improvements rather than changes," Reirs said.